CANADIAN DEFENCE MATTERS: QUESTION SIX, HOW CAN DND AND THE CAF IMPROVE THE WAY THEY SUPPORT THE HEALTH AND WELLNESS OF MILITARY MEMBERS? IN WHAT AREAS SHOULD MORE BE DONE? QUESTION SIX, HOW CAN DND AND THE CAF IMPROVE THE WAY THEY SUPPORT THE HEALTH AND WELLNESS OF MILITARY MEMBERS? IN WHAT AREAS SHOULD MORE BE DONE? 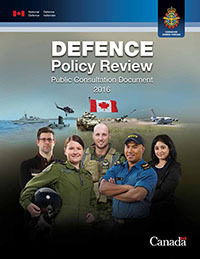 The Department of National Defence has launched public consultations for the development of a new defence policy for Canada. Canadian Defence Matters is attempting to come up with some answers to the ten questions contained in the public consultation paper. The most common complaint most of the public hear about how military members are being treated relates to the management of Canadian Forces veterans benefits. As it happens those issues are not within the mandate of the Department of National Defence. Veterans Affairs Canada is the department within the Government of Canada which has the responsibility for the pensions, benefits and services for veterans, retired and still-serving members of the Canadian Forces, as well as their families. This has been the case since 1928 when the Departments of Pensions and National Health became responsible for caring for ill and injured soldiers returning from that war. After World War II the volume of soldiers returning home made it clear that the Government of Canada would require a department dedicated to serving ill and injured veterans. This is now Veterans Affairs Canada and at this time it reports directly to a cabinet level minister. In other words, there is nothing, beyond advocacy, that the DND can do for veterans. As for serving members of the Canadian Forces it would appear that within the DND “health and wellness” are within the purview of Military Personnel Command. The Chief of Military Personnel “provides functional direction/guidance to the Canadian Forces on all military personnel management matters, monitors compliance with Canadian Armed Forces (CAF) personnel management policies, and is accountable for the effective management of the CAF Personnel System”. To enhance the resiliency and well-being of military personnel and families with mission support capabilities by training, equipping and organizing Medical, Dental, Chaplaincy and Personnel Support services. Therefore it would seem that the way for the DND and the CAF improve the way they support the health and wellness of military members is to take whatever steps are necessary to improve the ability of Military Personnel Command to deliver those services. Possible they could start with a concentrated attempt to remove as many buzzwords as possible from their ‘mission statement’.